Belgrade (AFP) - Thousands of demonstrators rallied around Serbia's presidential palace in Belgrade on Sunday, accusing President Aleksandar Vucic of authoritarianism and muzzling the media. The protest came a day after opposition supporters stormed a state-run television building. 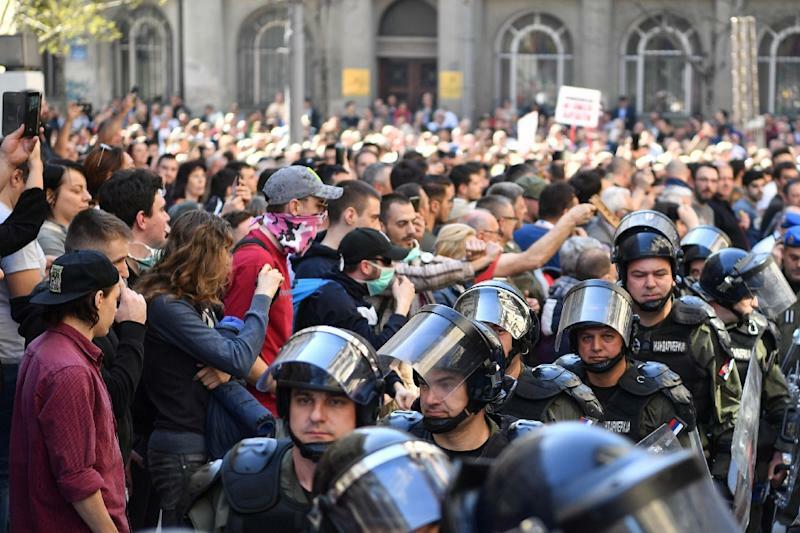 The events mark a new boldness in opposition protests that have been held weekly in the Balkan country since December against what critics describe as Vucic's slide towards autocratic rule. On Saturday night, dozens invaded the offices of RTS television -- which the protesters accuse of pandering to the ruling party -- demanding to address the population. The leaders of opposition parties have become more visible at the rallies, and among those storming the RTS building were former Belgrade mayor Dragan Djilas and Bosko Obradovic, head of the right-wing Dveri party. At Sunday's demonstration, the protesters practically blocked the presidency building for several hours. The trouble started when police tried unsuccessfully to prevent protesters from bringing a truck with loudspeakers close the presidency building. They moved on from there to the police headquarters, where they called for 10 arrested protesters to be freed. Police said only six had been arrested. The stand-off lasted around two hours, without incident. One protest leader issued an ultimatum to the president. "Aleksandar Vucic, you have until 3:00 pm Monday (1400 GMT) to free those who have been arrested. Failing that we will decide on a fresh protest and we will continue to the end," he said, calling on the government to resign. The protests have spread to dozens of other Serbian towns. In his press conference at the presidential palace -- broadcast live on RTS -- Vucic said he was not intimidated by the protesters, whom he called "hooligans". He also lashed out at the opposition, calling Obradovic a "fascist" and Djilas an "oligarch". Vucic, an ultra-nationalist turned pro-European, has rejected claims that he has become autocratic.